Search Santa Fe Summit real estate listings with Santa Fe Properties - your New Mexico homes specialists. With spectacular views that expand beyond the Colorado border, it's no wonder that Santa Fe Summit real estate is so sought after. It's not uncommon for residents to witness wildlife in their backyard on a regular basis. Additionally, the homes in this community are simply breathtaking. These residences have been particularly designed and constructed to take advantage of the natural landscape, while also maintaining their concealment. Steeped in privacy and views galore, and perched high above The City Different, are the amazing custom luxury homes in the gated neighborhoods of Santa Fe Summit and High Summit. Just a five minute drive east from The Plaza, up Hyde Park Road and on the way to The Santa Fe Ski Basin, this community is but a world away from it all. Are you ready to begin your search? Start by browsing the listings below or continue reading to learn more about Santa Fe Summit homes for sale. Sign up with Santa Fe Properties to receive access to advanced search tools. We'll even email you listings that meet your search criteria! 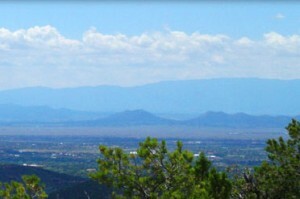 Santa Fe Properties' expertise in buying and selling Santa Fe Summit homes for sale is unparalleled. This community offers a small selection of properties, ranging from luxury adobe estates to acreage, waiting for you to build your dream home. The residences typically range from the low $900s to well over a million and it's easy to see why. From the beautiful interiors to the spectacular outdoor living areas, these homes are unlike anything you've seen. From floor to ceiling windows to oversized terraces, to French doors to media rooms, these homes have left no detail overlooked. Santa Fe Properties' expertise in buying and selling at Santa Fe and High Summit is unmatched. Dating back to the very beginning of the development in the early nineties, top producers at Santa Fe Properties have been and continue to be actively involved with the architects, builders and designers that have built Santa Fe and High Summit from the ground up. From picking out the lot, to working with a builder and designer to customize the home of their dreams, living at The Summit is truly special for its residents. As you can tell, residents at The Summit and High Summit enjoy the best of Santa Fe mountain living right out their doorsteps. Moreover, The Summit's enduring design covenants as well as paved roads, city water and underground utilities maintain the exclusive lifestyle residents have come to enjoy at Santa Fe and High Summit. Contact the Santa Fe Properties team to schedule a viewing of one of these properties. Or simply call them at (505) 982-4466 to learn more about Santa Fe Summit real estate.